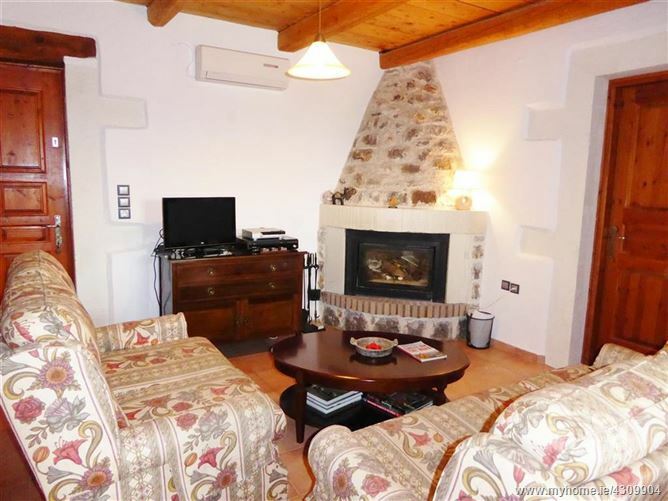 Three bedroom detached stone built Villa with private & secluded swimming pool. 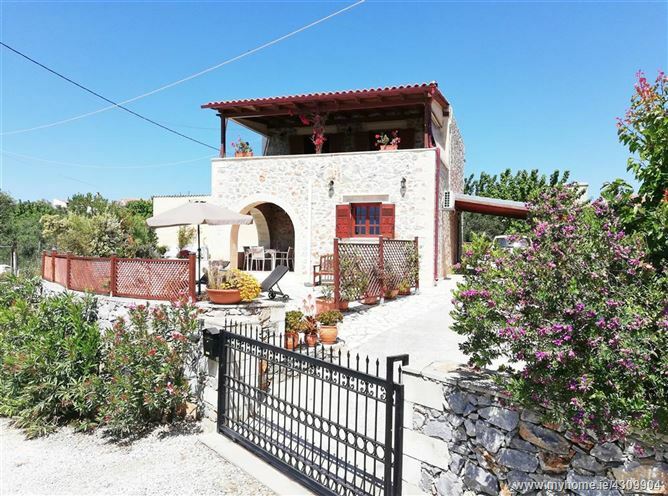 On the fringe of this classic traditional hillside village (750 m) gentle walk from the village centre with tavernas, kafenion, shops etc. Suitable for disabled access. 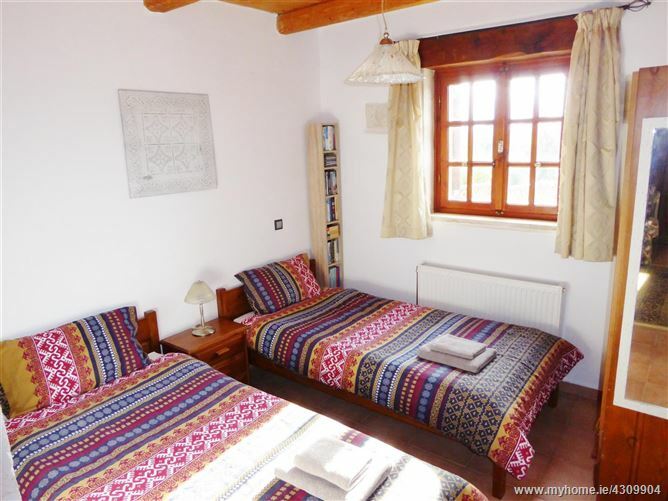 Approx 20 mins from sandy beaches & seaside resorts. Car essential but limited local transport. Deposit: 50 % of Rental. 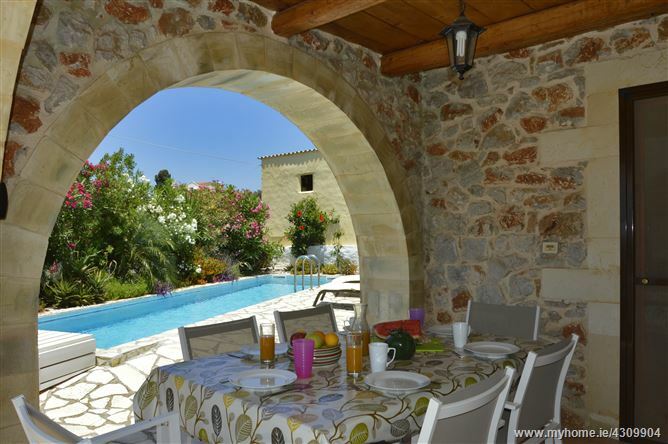 Villa Amour, Kefalas Village, Crete, Greece - sleeps maximum 6 / private pool / off road parking. *Weekly Lets only in peak season. 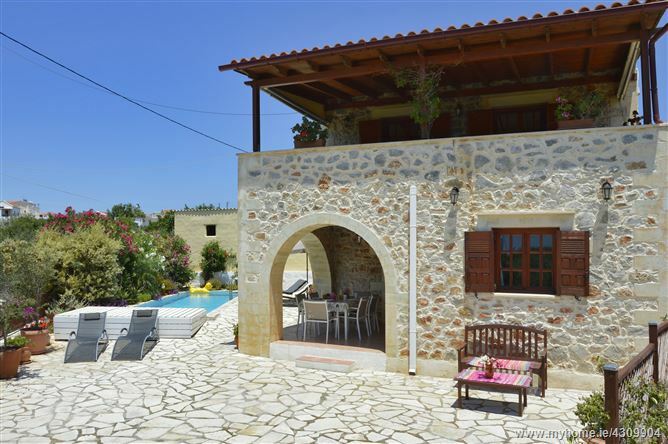 This attractive detached stone built 3 bedroom Villa with private pool has stunning views and is located only a few minutes walk from the centre of this traditional village and approx (12/15 kms) inland from the popular beach resorts of Georgeopolis, Kalyves & Almyrida, midway between Rethymenon & Chania. 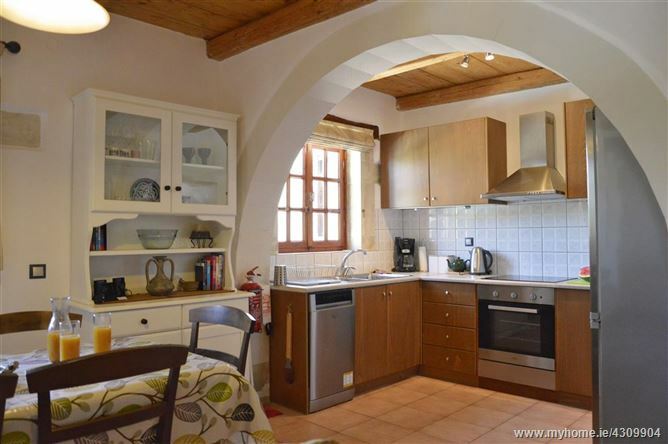 This is a pretty historic village in a slightly elevated location surrounded by olive grove farms with two established taverna's and two mini markets. Nearby (approx 10 mins drive) is a small quiet bay, Obrosgialos bay, with a cafe/taverna (seasonal) perfect for swimming/snorkelling in the crystal clear waters off the rocks. 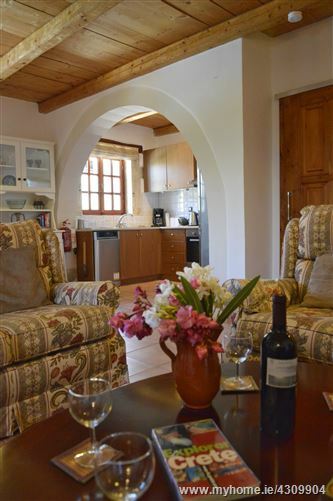 Ideal for those couples and families wanting to enjoy Cretan culture in a traditional village environment whilst only a short bus / car ride from nearby popular sandy beach resorts. The historic *Cities of Chania 45 mins * Rethymenon 45 mins. *Heraklion around 1.5 hrs away. Local buses operate daily but can be irregular so a car is essential to fully appreciate the area's attractions. • Security Deposit for breakages, * Caretaker nearby. • House linen & poolside towels provided but please bring your own beach towels. • Weekly changeovers by arrangement - sorry, no short breaks in peak / high season & school holidays. 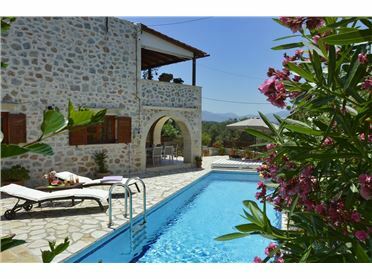 • Private swimming pool with night lighting, serviced weekly - secluded sun bathing area. • Well maintained with tiled floors throughout, electric air conditioning in all bedrooms, and living room. Cooking by electric hob / oven and off season oil fired central heating radiators and open fireplace. Dishwasher, fridge/freezer, w/machine, microwave, coffee machine, kettle, toaster. Flat screen TV, DVD/video - basic greek freeview TV. Free Wi-Fi. DVD library. Poolside timber decking /patio. Solar panel / immersion heater for hot water. All windows double glazed with timber shutters. 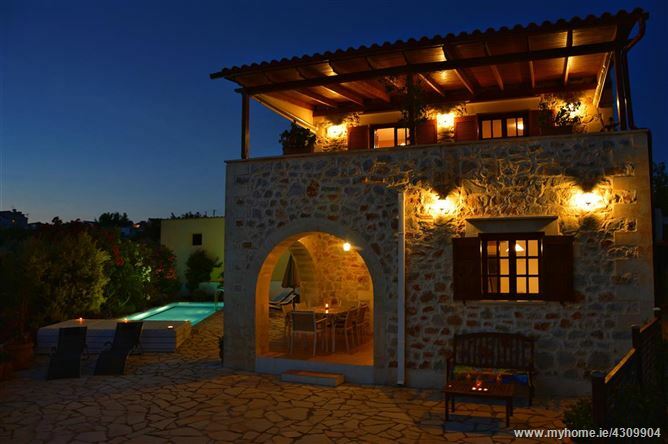 • The Villa has stone wall boundaries and is gated. 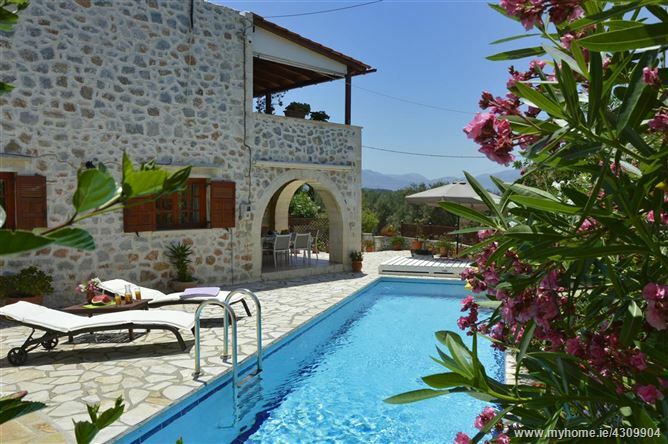 • Wi-Fi included - please note this can be erratic in Crete and may not be suitable for movie / gaming download. • Breakage Deposit. Serviced weekly. • Emergency use - local caretakers English speaking. *Non urgent call outs including TV reset if necessary may be chargeable. • All house linen & towels provided but please bring your own beach towels! 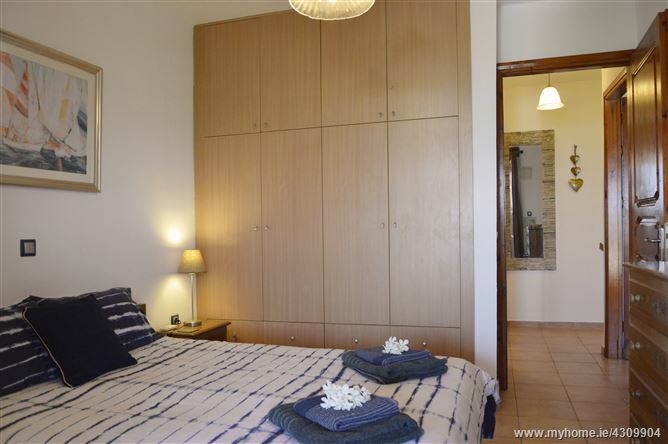 Room/Property Type: G / F - One twin bedroom, shower-room/wet room, lounge with air- con & fireplace, fully fitted kitchen / dining area with oven / hob, microwave, dishwasher, F/Freezer etc. External covered archway breakfast / diner area. 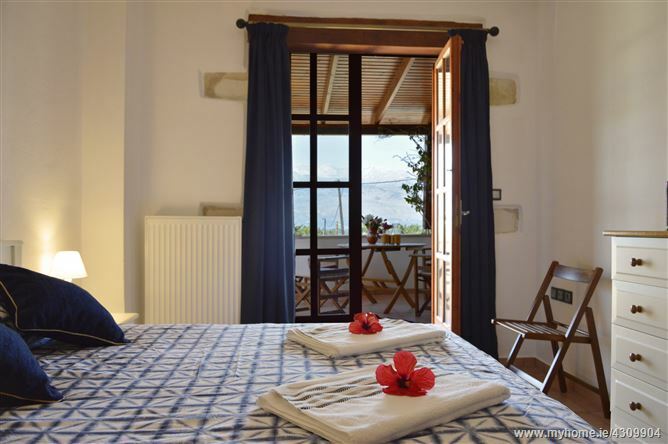 F/ F – One twin and one double bedroom with air-con, bathroom / shower, covered large outdoor dining / drinks terrace – seating for 4/6pax. Private secluded pool with lighting. Outdoor shower. BBQ area. Sun bathing area & sun beds / chairs - sun umbrella etc. Varied sports activities - 15 / 20 mins. - sandy beaches / beach sports / sailing / windsurfing / paddle boarding / kite surfing & water skiing. Fresh water Lake Kournas - boating & restaurants 20 mins. 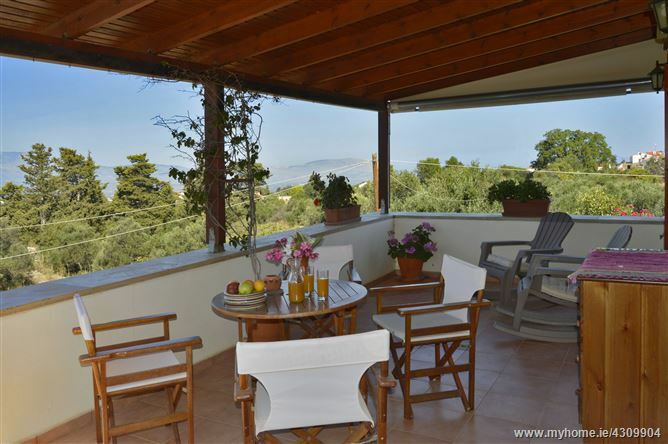 with extensive trekking footpaths nearby into and around the White Mountains. Historic ruins throughout the Island with regualr Tours available - see Vamos Tourist Board details. 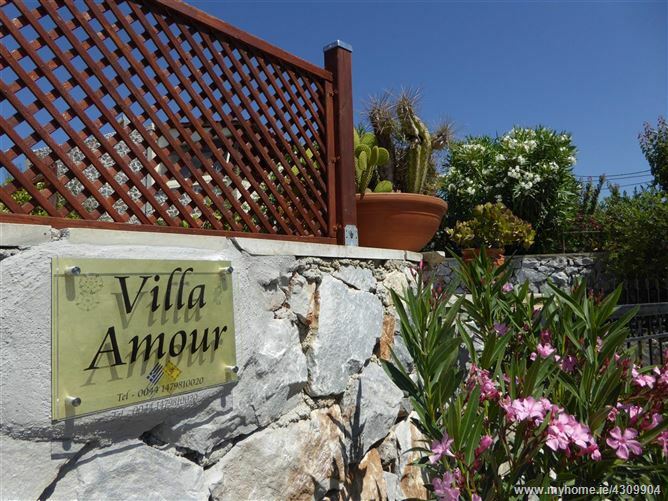 Tennis and gym / watersports - diving, parasailing in nearby beach resort - Almarydia (approx 15/20mins). Extensive trekking footpaths nearby with varied Gorge Trips incl. Samaria and great local sailing / cruises and diving centres.